Elms Lesters are currently hosting the Art on Foam exhibition in the UK during the European leg of this International exhibition. 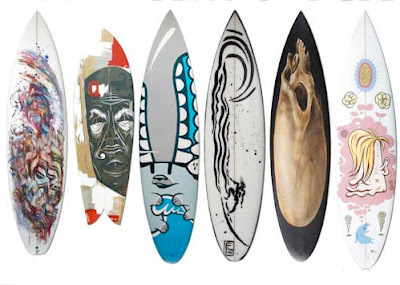 “Art On Foam” is an exhibition created by SpaceJunk and supported by Quiksilver, which brings together twenty-two artists who have applied their creativity to surfboards. Adam NEATE, Will BARRAS, FLYING FORTRESS, Andy HOWELL, Mr JAGO, Dave KINSEY, Caia KOOPMAN, Francois LARTIGAU, Lucy McLAUCHLAN, Jean LINNHOFF, Reg MOMBASSA, Randy NOBORIKAWA, Marcie O.NEILL, Mike PARILLO, Travis PARR, Andrew POMMIER, Jeff RAGLUS, Nicolas THOMAS, TINHO, Peter WEBB, Jono WOOD, Ozzy WRIGHT..